Pigs in a blanket bring us back to our childhood, but who says they’re only for kids?! 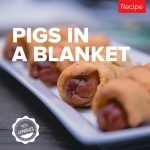 These are Keto approved and definitely making an appearance at our next Keto Reboot Tailgate! Place shredded cheddar and cream cheese in microwave safe bowl. Place dough in freezer for 5 minutes to chill. Cut strips of dough about 1" in width and 4" in length. Bake at 400F for 20-25 minutes, or until golden brown.